Coral Stone Mosques of Maldives is part of the Tentative list of Maldives in order to qualify for inclusion in the World Heritage List. Mesmerizing is the only word I could say when I looked at the amazing details of coral rock cravings of the Hukuru Miskiiy complex or the Old Friday Mosque in Male, the small capital city of Maldives. It was a great surprised that Maldives processes such a beautiful architecture gem which seem to be unknown among its many tourists who came to this coral atolls country for luxury resorts and beautiful coral sand beach. On my last day in Maldives before I went to the airport I decided to do a half day city tour. Male in general does not have anything interesting except the small precinct of Mulee-Aage Presidential Palace and Old Friday Mosque which seem to be the sole area that could be considered as historic area. While the Presidential Palace and Medhu Ziyaarath Shrine which dedicated Abu al Barakaath Yusuf al Barbari, a man who convert Buddhist Maldives to Islam, are beautiful colorful colonial architectures, the opposite is the solemn white minaret of Munnaaru, Old Friday Mosque and cemetery. At first glance, it was a bit disappointing, the mosque was quite small and its tin roof was totally underwhelmed; however, my eyes was immediately at the tombs complex, there are four beautiful tomb chapels around the mosque, their craving walls are really amazing with unique design that I believed inspired by sea creatures and sea grass with Arabic writings, the closest comparison in my mind is Celtic pattern art. Surrounding these chapels are many tombstones for royal and noble Maldivians, these tombstones are quite impressive, and some even has gilded decoration. The sharp pointed tombstones were for men and rounded one for women. The wall of the mosque reminded me the Buddhist temples in Sri Lanka which later influenced similar temple design in Southeast Asia with impressive cravings on multi-tiers walls next to the ground, the design was much simpler with design of small windows and gates; however, the real gems are at mosque entrances and the stairway walls with very beautiful designs that possibly the highlight of this buildings. During my visit it was afternoon prayer time, inside the mosque was full with prayers, so I thought it was not a right time to ask for permission to see interior, but from the front entrance I still abled to see another beautiful design for inner craving wall, beautiful wooden and stone columns and wooden ceilings. Another unique thing is the old well for cleansing before enter the buildings, the walkway from the well to the mosque is just lovely to see. Coral stone mosque of Maldives really opened my eyes to another side of this country, its beautiful cravings are in the same level of India and Sri Lankan arts. The layout of mosque also show some interesting cultural link with Buddhism and Hinduism which is quite outstanding. Too bad that this kind of art which supported by Maldivian Monarchy seem to be forgotten by locals after the country becomes a republic. Maybe because the craving designs have some link to religious, so no one seem to use them for any business opportunity especially for tourism which is unfortunate. If such art is founded in other country, I am confident that such craving design will be popular in gifts and souvenirs or even become a tattoo design. I visited this tentative site in November 2016. 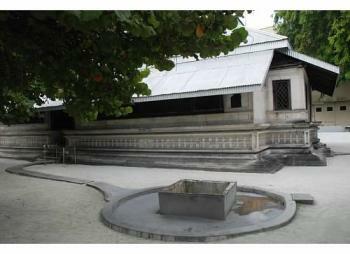 The Old Friday Mosque of Fenfushi is not looked after and alone would not deserve inscription. However, the Old Friday Mosque (Hukuru Miskiy) of Male is a true gem. The overbuilt and overpopulated capital of the Maldives is not the primary reason for visiting this country. Yet, I think it's a worthwhile stop before boarding a sea plane to one of the heavenly atolls. Hidden among several concrete buildings is a small green area with the Old Friday Mosque, a minaret and a 17th century Muslim cemetery. In theory non-Muslims are not allowed inside the mosque and there is a clear board stating this. However, a strange sentence caught my attention: "Non-Muslims who may wish to enter the mosque must obtain prior permission from the Supreme Council for Islamic Affairs". Although I was not looking forward to overcoming red tape while visiting the Maldives, I decided to try my luck at the Islamic Centre since it is right next to the Eid Mosque which is rather generously included among the tentative sites. Visiting the Islamic Centre alone most probably helped me to yield a positive answer as I got permission to visit the Old Friday Mosque. Unfortunately, however, your chances of success will surely decrease if you're in a large group or if your a woman. The interior of the coral mosque is rather dark but the coral pillars, the beautiful coral engravings and the unique lacquered wooden beams were a definite highlight to fully appreciate the OUV of this site. The exterior is not that grand especially since the corrugated iron roof is not that photogenic. I really enjoyed observing the different tombstones in the Muslim cemetery. Their sizes and shape vary according to gender, age and power. Women had roundish tombstones, men had pointed tombstones, royalties had a gold plaque and lavish coral engravings and children had tiny coral tombstones. 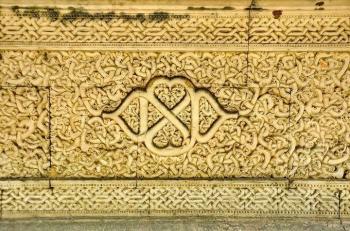 A number of 12th century mausoleums around the mosque were much larger and had the shape of tiny chapels with intricate carvings in Quranic script and geometric engravings. The most important and well-kept was that of Maulena Al-Hafiz Abul Barakaath Yoosuf Al-Barbari of Morocco who converted the Maldives to Islam in 1153 AD. This tomb is known as Medhuziyaaraiy or Central Tomb. The minaret's shape is similar to those at the entrance to Mecca. All in all, I think that these sites are worthy of inscription as they are truly unique and I truly hope they make it in 2018. In December 2013, I stayed at Conrad Maldives Rangali Island, which at the time sponsored the Maldives Whale Shark Research Program. I spent an afternoon snorkeling with whale sharks in the Southern Ari Atoll and was very lucky to see three whale sharks. I spent my final day wandering around Malé, where I visited the Friday Mosque, the biggest and one of the finest coral stone buildings in the world. 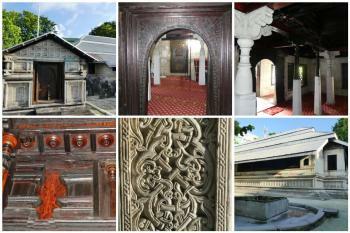 This site shows strong influence of Islamic Art in Maldives. This is one of the beautiful example of stone carving which was found in Maldives as same as hukuru miskiiy which is in capital city male'.. The Fenfushi Hukuru Miskiy it's almost more than 800 years old. But the government is gonna hiding the secret. And even they didn't repair the mosque and surrounding other ancient places. In my experience, fenfushi hukuru miskiy is older than male' hukuru miskiy. but the government is not protecting that place as the way it should be protected. They are protecting male' hukuru miskiy only. As a proof of this they are not advertising that place.